This article is dedicated for reporting performance problems with IntelliJ IDEs and related information to JetBrains support. You can submit a support request via Help menu in your IDE or via Submit a Request button at the top of this page. Please refer to this document for reporting the problems when IDE is completely frozen and doesn't respond to any actions for a long time. With the Performance Testing plug-in enabled use Help | Diagnostic | Enable CPU Profiler (supported only for IntelliJ IDEA and PhpStorm at the moment, for the other products please read below how to add the proper VM option to enable profiling). IntelliJ IDEA and PyCharm Community Editions do not include a YourKit profiler agent, because the YourKit agent library is not open-source. To take a CPU or memory snapshot with the Community Edition, you can download an evaluation version of YourKit Java Profiler, copy the yjpagent library to the IDE bin directory, add it to the .vmoptions as described above, and connect to the running IDE instance from the standalone YourKit Profiler UI. Since 2018.3 IDE version please hold Shift while clicking on the Start CPU Usage Profiling menu item when asked to provide the snapshot with invocation counts (please do not provide the snapshot with the invocation counts if you were not explicitly asked to do so). When IDE hangs and doesn't respond so that you can't use the menu to capture the snapshot, please provide the thread dumps. Adjust this line depending on the OS and the JDK (32-bit/64-bit, see in Help | About). Please check the Enabling Profiler Agent section above. You just need to replace delay=10000 option with the sampling option and make sure NOT to specify the probe_disable=* option. CPU snapshot file will be saved automatically after your close the IDE into your HOME/snapshots directory with the .snapshot extension. The new line is needed since at least idea-IU-117.798. The name of the library is now libyjpagent-linux64.so. Michael Hirsch, thanks for the correction, I've updated the document. I'm seeing hanging too, with pycharm maxing the CPU for about a minute when it happens, which seems to be when I open a contextual menu. 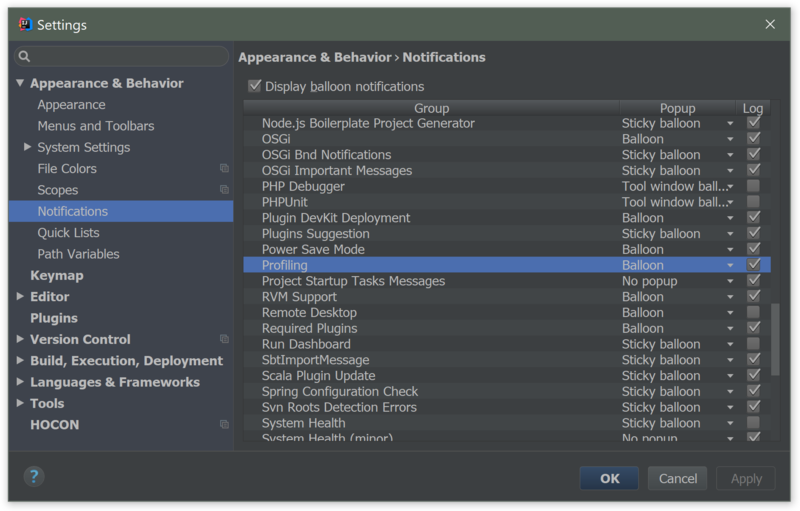 I am also seeing hanging in pycharm 3.4 when using the contextual menu. Should I submit some Snapshots? I have 8.03 on Windows and cannot save my CPU Snapshot. After I click Stop CPU Usage Profiling there is no way to save the snapshot file. Thanks Serge - I also needed to turn Profiler notifications on (they're disabled by default). I got it now though. How do you disable the profiler if it is on by defautl? I am having performance problem and want to try to turn this part off. I'm unable to edit idea64.exe.vmoptions on my Windows machine...seems there's some process that's using it and not allowing me to edit it. I've closed completely out of IntelliJ IDEA and still can't edit it. Run your editor as Administrator, then open the file and edit it, otherwise UAC will not allow to edit files under Program Files folder for regular users. I'm such a dummy...just got a coffee so that will hopefully help my brain work! It is annoying that I'm running as an Admin on my PC and yet I have to grant the User group permission to modify the file...all set now...thanks. IntelliJ is very aggressive about toString()'ing things in the debugger, and when I disabled the cache on my database to try to slim-down our memory profile, boy did that get me in trouble. Specifically, I'm using MapDB which (as the name implies) has databases that interface as java.util.map objects. As such a mapDBStoreObjectThatsInstanceOfMap.size() call, when the database isnt caching, will take a really long time. Any chance there's a @Debugger(ignoreField = true) annotation I could put on this field or something similar? Better yet, If I could make a feature request, it would be that whatever code is evaluating the toString of these things in the environment, does so on another thread with liberal use of timeouts. Sam, please submit a ticket to support with idea.log (https://intellij-support.jetbrains.com/entries/23352446). I had no WebStorm folder so I created one and copied the webstorm.vmoptions file to that location. I was supposed to get the tools "Start CPU Usage Profiling and Capture Memory Snapshot". I only have "capture memory snapshot" which was present from the beginning. You are looking in a wrong folder, search for the existing one, it's under ~/Library/Preferences, not /Library/Preferences. ~ stands for /Users/<user name>, so the actual folder is under /Users/<user name>/Library/Preferences. Is it possible to capture CPU Snapshot automatically? I am requested to do so but I am unable to save snapshot because IntelliJ will hang indefinitely once the issue happens. Martin, in such cases you should provide a thread dump instead: https://intellij-support.jetbrains.com/entries/23348667 . ??? ????? ?? ??? ??????????? ??? ?? ?????? ? Please submit a ticket to support with a memory snapshot. 1) ? ?? ??????, ? ????? ????????? ?????? ?? ?????????? 2) 40 ???????? ? ???? ???????? ??? ???? 3) ????? ?? ?? ???? ?? ?????? ? ????? ??????? ??????. ??? ???? ? ???????? ???? ?????, ? ???? ??? ??????. Luke, make sure you've added it to the correct .vmoptions file per https://intellij-support.jetbrains.com/entries/23395793 . Note the Mac OS X specifics (modify a copy of the original file). Check idea.log to ensure that profiler agent was loaded. YourKit agent is already present in the Ultimate Edition. If you are using Community Edition, you need to connect to IDE via profiler UI, there will be no buttons in the menu.